Lacombe, Alberta – Canadian country music star and Sony Music Canada recording artist Gord Bamford raised a total of $469,720 at the 11th Annual Gord Bamford Charity Golf Classic in Alberta, Canada that took place on August 15th and 16th, 2018. Artists Aaron Pritchett, Dallas Smith, Chad Brownlee, Tebey, Beverley Mahood, and Bamford himself took the stage and entertained the 800 people who attended the sold-out private event in Red Deer, Alberta. A crew of songwriters made their way from Nashville to share stories and songs from the trenches of the country music world. These included Buddy Owens, Galen Griffin, Brett Jones, and Brice Long. Local artist and songwriter Duane Steele was the host for the songwriters round. Bamford attributes the event’s success to long-time supporters and sponsors, country music’s strong sense of community, a solid committee, and an enthusiastic group of volunteers. Alberta-based business JEDCO Energy Services came out as this year’s title sponsor. Contributing to the fundraising total was an in-home dinner for 8 prepared by Chef Corbin Tomaszeski in partnership with Delegat Canada and ETC Decor. There were multiple bidders for this package so Chef Corbin generously offered up 3 separate packages! A once in a lifetime trip for 5 to Pittsburgh was auctioned off to two separate high bidders for $35,000 per trip. These guests will watch 2 NHL games while there, enjoy the Penguin’s practice facility for a session, and be hosted by Pittsburgh Penguins Assistant Coach Mark Recchi and Gord Bamford. Bidders also paid for the opportunity to have a celebrity join their golf team the following day. The list included, members of the hockey world Mark Recchi, Theo Fleury, Marty McSorley, Curtis Glencross, Kris Russell, Craig Simpson and Rob Brown. Olympians Brad Gushue, and Melissa Hollingsworth were also among the athletes who donated their time and golf skills to the cause. “This event is a testament to the way Albertans pull together to support their communities. It’s been 11 years of building tremendous friendships with sponsors, attendees, and the great people that operate these important charities. It’s a real pleasure to be able to support such a long list of worthy recipients,” said Gord Bamford. 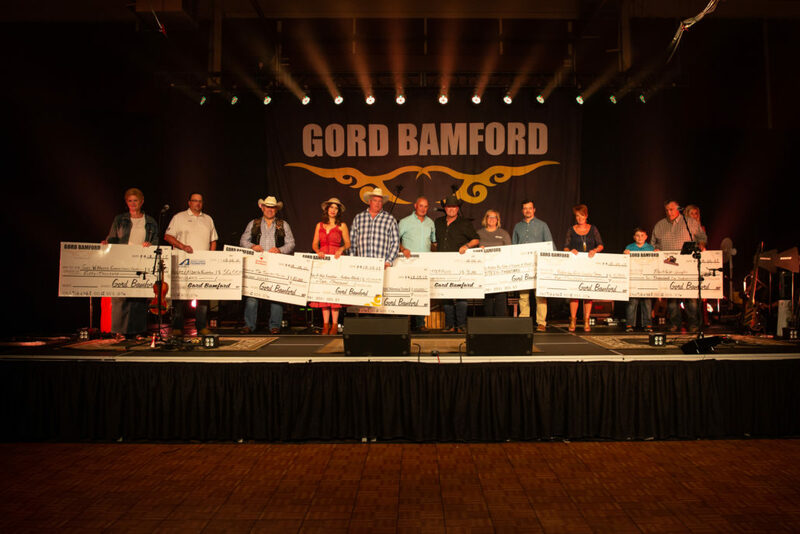 Monies from this event are the main source of fundraising for The Gord Bamford Charitable Foundation and are delivered to a variety of youth-centered charities across the country. Charities that came to the event to receive their cheques included MusiCounts, Big Brothers & Big Sisters of Lacombe & District, Make-A-Wish Foundation, The Sutter Fund, Hockey Alberta Foundation, Central Alberta Child Advocacy Centre, Canadian Tire Jumpstart Charities, RDC College – Gary W. Harris Canada Games Centre, Blackfalds Wranglers, and Robbie Dean Family Counseling Centre. Gord Bamford Foundation proud supporter of MusiCounts Thank you!